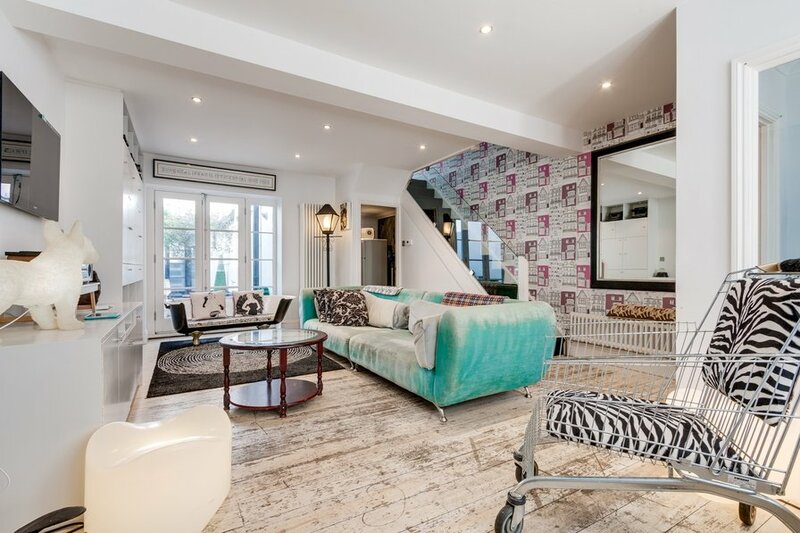 Stunning three bedroom/two bathroom townhouse with modern facilities, stylish decor and rustic charm. The property has been designed to let light and air flow through - it definitely stands out from the crowd. Entrance is on street level. A lobby for coats and hats (including a couple of macs and umbrellas) greets you, then a spacious through-lounge with doors opening onto a private courtyard. There is a utility area with washer/dryer and fridge leading into an impressive kitchen with black gloss units and table illumined by a skylight. One of the walls is a chalk board too so you can write messages to each other or let your kids go mad with some chunky chalk sticks. Double doors from the kitchen also lead onto the courtyard. The reclaimed dining table and benches is suitable for 8-10 guests; larger groups can turn the table round and enjoy buffet style dining. In the utility cupboard you'll find everything you need - an iron, plenty of airing racks, washing powder, softener, vacuum cleaner and all the usual items you'd expect at home. This kitchen has all the mod-cons, plus tea, coffee, sugar, salt, pepper, oil, vinegar and all the condiments you'd hope for. It is also very well equipped with a huge array of crockery, pots and pans, glasses and cups. There are always sufficient champagne and wine glasses. The lounge is double-glazed so although the property is right in the city centre, anyone using the sofabed will have a restful night’s sleep. The sofabed itself is a quality Italian brand with a proper sprung mattress. Family bathroom: a stunning bathroom with WC, basin and feature roll top bath with shower over. Ample towels, basic toiletries and toilet tissue included. Bedroom 1: the double-glazed Bedroom 1 is currently arranged with two 2ft 6 beds and two 2ft 6 antique French metal beds. This is a beautiful room with fitted wardrobes and a chandelier. It also has a wall-mounted TV/DVD player with Freeview. Bedroom 3: this room features two single beds and one fold out chair bed. The two singles can be zipped up to make one large 180cm wide bed if required. This floor is entirely occupied by the "master suite" - a beautiful tranquil loft room and ensuite bathroom with basin, WC and Whirlpool jet bath with both shower over and hand-held shower. The jet bath measures 1800 x 1000 so plenty of room for two - or more! There's a variation of jet speeds and underwater lighting too. Underfloor heating also installed. This is certainly the “love nest” of the house with a TV/DVD player with Freeview and stereo/docking station. It has a king bed 160x200 and plenty of storage. This property carries a £500 refundable security deposit. Brighton is notoriously anti-car so it's best to leave the car at home if at all possible. That said, there are plenty of parking options but be prepared to pay in excess of £15 per day. Please ask us if driving as we have a helpful information sheet. THIS PROPERTY IS NOT SUITABLE FOR ROWDY GROUPS. No parties or noise in the house. Smoking is permitted in the courtyard only. No noise outside after 21:00. Thanks for your understanding. If this property is not suitable for any reason, please email - we may have other properties of interest.